This apartment of 100 sqm is located in the historic center of Naples, in a building of the '700. The apartment is on the fourth floor. Bright and quiet. Split over two levels, two double bedrooms and a bathroom are located upstairs. The very large kitchen, fully equipped, with a dining area, a third bedroom with double bed, a spacious living room and a second bathroom are located on the lower level. The rooms are spacious and elegantly furnished. We absolutely loved this rental. Sonia was very nice and gave us a lot of info. The apt was perfect and has more than enough room for the 6 people we had. The neighborhood is true Napoli. You can’t put a price on the experience of being able to live for a time and get a glimpse into the lives of these amazing people. Via Tribunali and the surrounding streets are like no where else and respect for the culture and an empty stomach is all you need to bring. Definitely reccomend and will be back. Thank you! The apartment was less than 15 minutes walk from airport bus stop/train station, and convenient to the historic centre. It was as described, clean and spacious. Our only negative was the lack of a kitchen knife. Luckily the charming fishmonger opposite prepared the fish for us so we could take advantage of the local shops. We would definitely recommend this flat. 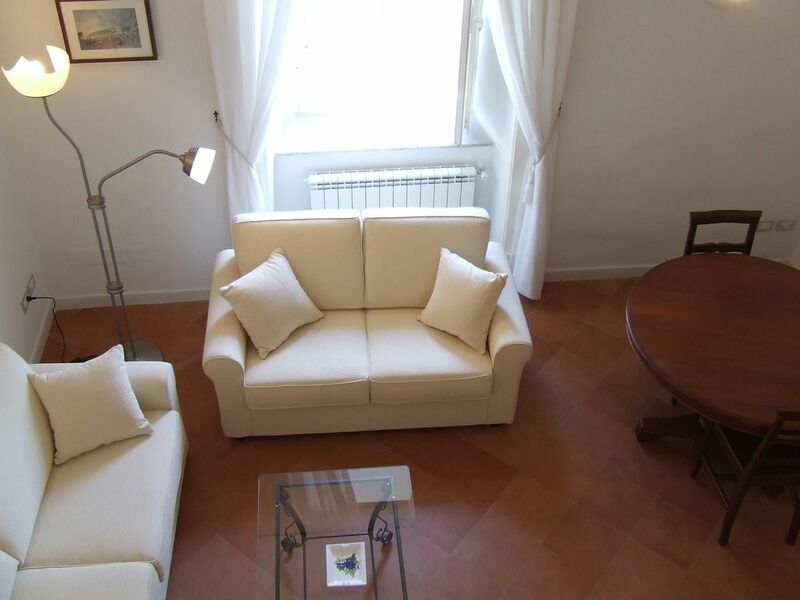 This apartment is located on one of the main roads in the ancient heart of Naples. The apartment is large and easily accommodated our family of 5 - including two teenagers. The apartment is clean and well appointed with a fully functional kitchen and two baths. I would not recommend bringing a car here as parking would be extremely challenging. Luckily, the location is terrific for easy walking access to any of the sites in the Central district. The Bay of Naples is about 3 km away which is walkable but there is also a taxi stand at the nearby Duomo, so you have options. Definitely a great location from which to explore this exciting city. Absolutely superb apartment - you even get a view of the sea (ok it's a way off but it's there). Very well provisioned, light, airy, spacious and couldn't be better positioned for the main sights of Naples. There's a small supermarket just across the road, a couple of excellent fishmongers and a bakery just steps away. And if you like pizza all the most famous and historic ones are minutes away. And Sonia herself couldn't be more gracious and helpful. We were very satisfied with the apartment which was exactly as shown in the internet pictures - bright , roomy and very quiet - an oasis of peace in the midst of the very lively historical centre of Naples. The apartment was well-appointed and very clean. It is secure as the main gate is closed evenings and at weekends. It is convenient to bars,restaurants and all shopping can be done locally on foot. The apartment is ideally situated and can be recommended as a basis for Naples and day trips to nearby Pompei,Amalfi Coast , Sorento and Capri. The manager, Sonja, proved extremely helpful,informative and effective. We highly recommend this place! many thanks for your goodwill, finally did you manage that ! I hope to meet you again in Naples. Want to discover the south of Italy, and stay in a vibrant and lively town? Naples is the right city for you! The area in which the facility is called Spaccanapoli, a very characteristic district with folklore, where you will find some of the restaurants, trattorias, pizzerias and bars more typical of the city. Here you are in the heart of Naples greek-Roman, close to the churches, palaces, from the famous Duomo di San Gennaro and the famous San Severo Chapel which houses the wonderful sculpture of 'Veiled Christ'. Naples is a rich and animated city where you will not fail to have fun! Along the coast of Naples, then you will find many beaches for a dip. Many tourist destinations are located within a radius of 30-40 km, such as Pompeii, the Sorrento coast, the Amalfi Coast, Capri ... In short, a rich and animated in the south!